In a nutshell, we: A) send your direct mail campaign through the postal service as usual, and then B) overlay your mail file with the Facebook member list. The people on your list who are also on Facebook will be retargeted multiple times, giving you the ability to get more touches of the same eyeballs on your offer—without spending another penny on postage. Note that we are not saying you should switch to digital marketing. On its own, social media or digital marketing perform very poorly. Our strategy is deeply rooted in direct mail, with Facebook as extra leverage. But why would anyone want to pay more for Facebook? Because the biggest chunk of a direct mail campaign cost is always the postage and the fixed costs of setting it up, so integrating all that hard work with a secondary marketing channel is extremely cost-effective! Does it make you more money? In general, using Facebook Retargeting can help boost response rates by 5 to 25 percent over (an already awesome) traditional direct mail approach. So… yes. Let’s dig into an example, and assume you run a dental practice. The average gross profit is $300. On average, people come in twice each year. The average customer stays with you for three years. Let’s say this the campaign costs you $54,000 for strategy 50,000 sales letters. This includes campaign strategy, creative, targeting, mail list rental, print, mail, postage, the Facebook integration, and 200,000 Facebook ad impressions. A conservative, below-average direct mail response rate of 0.5 percent from the traditional direct mail campaign. (expected response rates from a highly targeted rented list should range between 0.5 to 2.0 percent). Of the people who called, you close only 25% of them (most service-based businesses close between 10-50% of their leads). But we can expect 300 leads flowing in. Out of those leads, if you only convert 25 percent of them into sales, you will end up with 75 new patients (300 leads x 25% close rate = 75 sales). Which brings you a Return on Investment of $81,000, or 150 percent. Facebook Retargeting contributes $22,500 in revenues. See the full stats below. 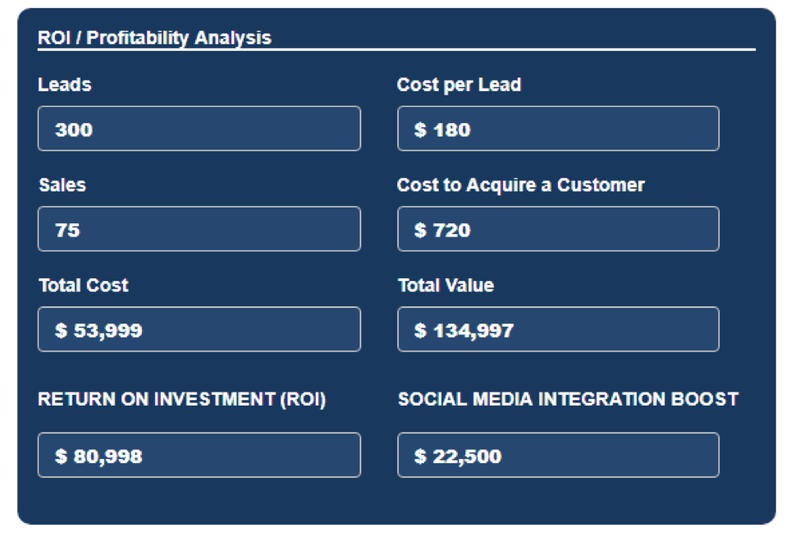 This table compares the results between traditional vs. Facebook-integrated campaigns. If all conditions remain the same, Facebook Retargeting will improve everything across the board. You will now enjoy more leads, more sales, and even better ROI. 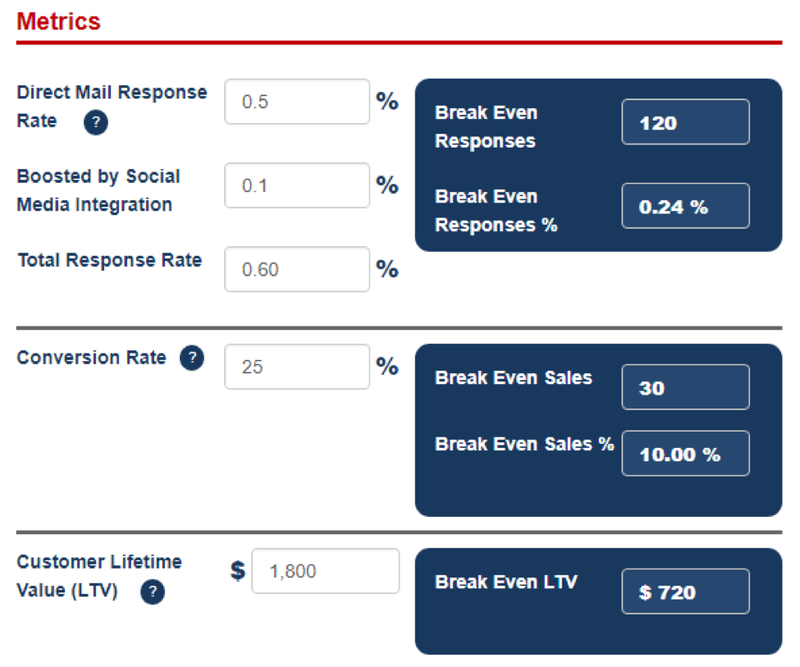 Note: if you want to run your own scenarios, click here for our step-by-step Direct Mail ROI Calculator. So, Should You Be Happy Spending $54,000 to Profit $81,000? Heck, No! Yes, you read it right. Why not? Because you and us can always do better! This is one of the biggest advantages of working with us. Look, it’s not rocket science, but it takes a great deal of care, expertise, and creativity to craft a direct mail campaign that works. It takes a lot of experimentation and reviewing the results to make it optimal. As we mentioned, the numbers used in these case studies were very conservative, imagine what you could achieve when everything is clicking together. Don’t trust our numbers. They may be different from your industry, after all. Instead, run your own. We’ve created a simple, yet powerful Direct Mail ROI Calculator so you can model your own business scenarios, and forecast how direct mail can help you create more customers. Contact us for a free one-on-one consultation. Still, we figure you might want to check us out before you do business with us. As a customer-first business, we owe our success on a set of Core Values: 1) Partner, Not Just Vendor, 2) One-stop-shop, 3) Never Shortsighted, and 4) Delight Our Clients.